This summer, Peak are teaming up with artist Bettina Reeves to create the art installations for this September’s 20th anniversary edition of Abergavenny Food Festival. Peak are delighted to be involved for another year thanks to the generous support of Abergavenny Town Council. 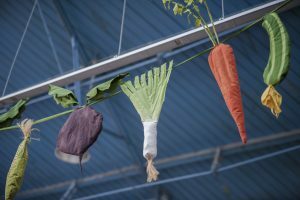 The artworks, based around themes of food and rural life, are suspended from the roof of the Market Hall and are a much-loved feature of this annual Festival. For this year’s project, Bettina has chosen the theme of A Moveable Feast, though details are being kept under wraps in the lead up to the Festival. Peak are looking for a dedicated group of volunteers to help them realise this fantastic project. You don’t need to have any prior experience of craft and making as Bettina will guide you throughout the process. Their most recent group craft project with Bettina was the UK-wide mass participation artwork Processions, which saw Peak’s banner proudly lead the crowds during the Cardiff event. The participants did a fantastic job and not only learned practical craft skills during the project, but also enjoyed the process making something beautiful together. “Everyone who takes part gets such a sense of pride and achievement and the camaraderie, fun and great lunches add to the enjoyment of the project. New faces are very welcome; it’s for all abilities and for any age over 16 years”. If you would like to get involved in this unique project, email rachel@peak.cymru with your name and confirm if you can attend the scheduled craft sessions. Work begins on Tuesday 28 August at Peak’s Crickhowell studio, and the project runs daily (except Sundays) until Wednesday 12 September.